Pisa and Florence (Up to 8 persons for each Minivan Mercedes-Benz). The tour most requested from Livorno port is undoubtedly the Pisa and Florence shore excursion. Normally we can arrange this tour in full day (8/9hours). Our english speaking guide/driver will welcome you at the docks. After brief greetings and pleasantries you will head straight to Pisa. We suggest to spend about an hour to visiting the Leaning Tower and Piazza del Duomo,(the Miracles Square) a UNESCO World Heritage Site. From here you will continue on Florence way. 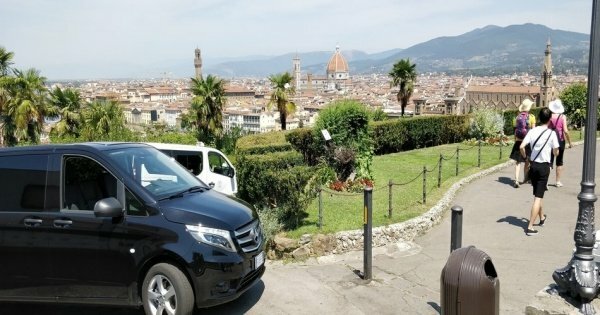 The driver will first stop at the Piazzale Michelangelo, the world renowned terrace and from there, once you have taken some shots from a special evocative view, you can visit the main monuments by minivan and in free walking tour. Then your driver will remain always to disposal you for anything and he will suggest to you all the best about the Florence. You will have the time to visit the main monuments, shopping, take a special light lunch, taste a fantastic Gelato in one of the best Gelateria in Florence and get back in time before your ship leaves from Livorno port. Please, send us a request, and we will be happy to provide you, a detailed plan for this kind of shore excursion with all the timings of the tour. Driving in the typical narrow streets to history center around the most important monuments. Stop in Piazzale Michelangelo (it is a giant balcony where will be possible to admire all the city Florence from the top ,in a evocative and exciting view and take some shots) . Stop in Santa Croce Square, where it will be possible to visit the museum inside the church where Guests see the ashes of the most important Italian people like Macchiavelli, Dante Alighieri, Michelangelo, Galileo Galilei. The same value for Florence, (an entire historic centre Unesco heritage ) land of the most important artists of the history as Leonardo da Vinci, Michelangelo, Giotto, Raffaello, Macchiavelli, Dante Alighieri and Galileo Galilei with the countless Renaissance's museums is considered the capital of the art world. Two city's art that you can enjoy in full day tour, touching the main monuments of the Renaissance between churches, Towers and Museums. Not counting the fantastic shopping and typical Tuscany restaurant for the historic and medieval, narrow streets where you can find a whole day full of art, history, good foods and excellent wines. Important Travel-time informations . From Livorno to Pisa ( 25 min depending traffic) From Pisa to Florence (1hour and 15 min depending traffic) From Florence to Livorno Dock Ship ( 1 hour and 15 min depending traffic).